Yitzhak Zahavy is competing this Sunday in a grueling sports event because he can. He can, he says, because three of his comrades gave their lives to save his. He is competing to honor them. Zahavy, who was born in Rhode Island, moved to Israel and joined the Israel Defense Forces. In October 2002, he and three friends confronted a suicide bomber as they were waiting for a bus near a gas station outside the west bank town of Ariel. Matan Zagron, Tamir Masad, and Amihud Hasid lost their lives in an attempt to prevent the bomber from detonating his device. In giving their lives, Zahavy says, they saved his. 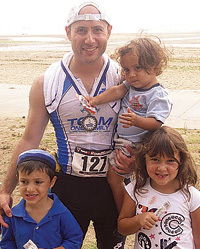 On Sunday, Zahavy will compete in the Nautica New York City Triathlon in their memory. The Bergenfield resident is racing on a team organized by One Family Fund, a nonprofit organization that supplements the efforts of Israel’s government to help victims of terror and their families. He hopes to raise at least $3,000 — $1,000 in memory of each of his three friends. He exceeded that goal in last year’s race. His efforts on behalf of his friends’ families began in 2009 when he met Ariel Kotler, at the time executive director of One Family Fund, during services at Cong. Beth Abraham in Bergenfield. Kotler helped Zahavy find the family of Amihud Hasid. Zahavy raised funds to help two of Hasid’s five children, a boy and a girl, celebrate becoming a bar and bat mitzvah. That led to his first triathlon last year, a 1,500-meter swim in the Hudson River, a 40-kilometer (25 mile) bike ride through Harlem and the Bronx, and a 10k (6 mile) run in Central Park. Alerted to the possible threat, the soldiers ran toward the bomber, shouting at him to stop, but he ignored them. “Tamir Masad died jumping on top of him to [try to] prevent him from releasing the mechanism that detonated the bomb,” Zahavy said. Zahavy, who was farther away than the other soldiers, also moved toward the bomber, rifle at the ready. He also gets strength from his wife Julie and daughter Shaiel, 7, as well as his sons Yair, 5, Gavriel, 2, and Eitan, 2 months, he said. For information or to pledge a donation, visit Zahavy’s page at the Team One Family web site http://bit.ly/js-yitz. To donate by mail, make all checks payable to Team One Family, include Yitzhak Zahavy’s name in the memo line, and mail to: One Family Fund, 1029 Teaneck Road #3B, Teaneck, NJ 07666. This entry was written by Heather Robinson and posted on August 7, 2011 at 9:27 pm and filed under Features.